With all the stresses coming from all corners of the house, I am currently dreaming and looking forward to our brief Davao getaway. While the idea of my going away for a while for a full week should be lovely, I cannot help but also get concerned as I am leaving a whole lot of things behind – including the current finishing of the construction of the house. You see, we had this flight booked way before the plans of construction started. Not to mention it also got pushed back months later because of some very unfortunate circumstances we had to deal with. But we trust that God will deal with the people concerned. We are never just living for the here and now and we all will give account to whatever we choose to do in this lifetime. Just saying. 🙂 Moving on.. I know I could have composed this photo better. But we all know how challenging it is to shoot sport activities. 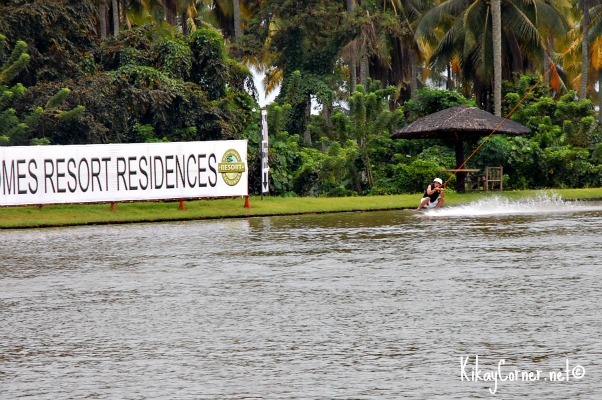 But look at the lush greens surrounding the Deca Wakeboard Park! It’s even lovelier in person!